Note: Pictures and objects may have a slightly difference in the color and we will try our best to keep consistent with the real. The Taken Samsung galaxy S6 edge Case Card Holder is a perfect fit for your Samsung S6 edge! three slots, two for cards and one for cash. Simplify your life and your pocket. Please notice that Taken galaxy S6 edge Wallet Case is an online exclusive. We have not authorized any other retailers to sell our products. The Samsung S6 edge leather wallet case uses high-end PU leather, while the front cover uses quality epoxy insulation board that promotes stability and durability. It is molded off of a real Galaxy S6 edge in order to make the perfect fit. We have seen the others and decided to break from the trend to design a case that takes the user experience to another level. Our customers can easily and comfortably use their Samsung S6 edge screen, camera, microphones and other ports. Match up to your business attire; Stand out and look great! We will make sure that your case arrives scuff free and as fresh as it was when it left the factory. The case is packaged to eliminate moisture in order to preserve the leather. 100% SATISFACTION GUARANTEE - No questions asked money back guarantee. Your satisfaction is our guarantee! If you aren't 100% satisfied with the item for ANY reason within 30 days of purchase, we will refund the full purchase price. We back our quality product with sincere service and have established a good reputation in the marketplace based on our attentiveness to the customer and our ability to resolve issues. No business or product is perfect but we strive to make every experience that way. If you have any issues or concerns please feel free to contact us. Thank you for looking at our product! It is made of the thermoplastic polyurethane plastic(NOT TPU)and high quality soft genuine PU leather in order to protect the environment.It doesn't smell or affect your health.We use A+ hard shell instead of scrap material silicone shell.It is fashion and vintage.Optimal price offered, comparing with other similar products in the market. We also use epoxy boards instead of cardboard to increase screen protection and water resistance(inside the holster baffle). It is easy to install. Shockproof / Waterproof / Dustproof / Scratch Proof (Rubber edge). TAKEN screen protector providing full(360 degree) protection and security for your Phone(glass screen),cash and cards. 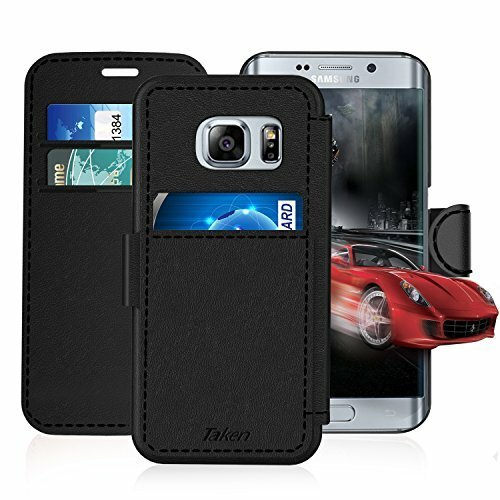 Taken Cell Phone accessories Samsung galaxy S 6 edge folio cases.It belongs to holster / wallets / wallet / flip / shell / cover / covers / purse / purses / bag / bags / handbag / handbags / hard.The special sewing for the edge, compared to glue or ordinary sewing more solid and durable.We are particular about every details of production. And the case is handcrafted from premium-quality leather to ensure durability and show elegance and luxury. Amazon Prime enjoy free shipping.Top rated.The best holiday / New Year gifts / present for business ladies(lady) women(woman / womens) men(man / mens) girls(girl) boys(boy).And well-designed package suitable for present.Rest assured that our leather case is backed by our lifetime warranty and service. If you have any questions about this product by Taken, contact us by completing and submitting the form below. If you are looking for a specif part number, please include it with your message.